I have never met a piece of dark chocolate that I didn't like. Until tonight. My family and I went to the store and I was happy to find a dark chocolate bar on clearance. It had flax seed in it, which I assumed would be ground up into the bar. Nope. The bar was full of toasted whole flax seed. The combination of bitter dark chocolate and nutty flax seed was not delicious. My oldest took one bit and told me that he was done. You know there is something wrong when your kids refuses candy. Needless to say the majority of the bar is in my freezer for when I have a chocolate craving that has to be satisfied regardless of the taste of the chocolate in question. Lucky for me I had made brownies yesterday, so as soon as I got home I ate one. So much better than the chocolate bar. When I made the brownies yesterday I tried a new recipe for Cocoa Brownies from the Food Network. This recipe has 8 ingredients. It takes 1 hour of total time, 15 minutes of which is active and makes 16 brownies. Due to a lack of eggs I made a number of major changes to the original recipe. First I only had 3 eggs, not 4 so I modified the recipe. Since I reduced the amount of eggs I also reduced the butter to 10 tablespoons. I am a big fan of dutch cocoa, the flavor is intense and delicious and it's what I used in this recipe. Finally, since I can't eat gluten I substituted brown rice flour for the all-purpose flour used in the original ingredient list. My baking time was exactly 45 minutes plus cooling. With gluten free baking you really do have to allow things to cool or they will fall apart. These brownies turned out very rich and chocolatey. My boys and I were big fans of the intense flavor and they didn't even notice they were made with brown rice flour. The brownies turned out fudge like, which I like. I'm not as big of a fan of cake brownies, I would rather eat a great chocolate cake with frosting. 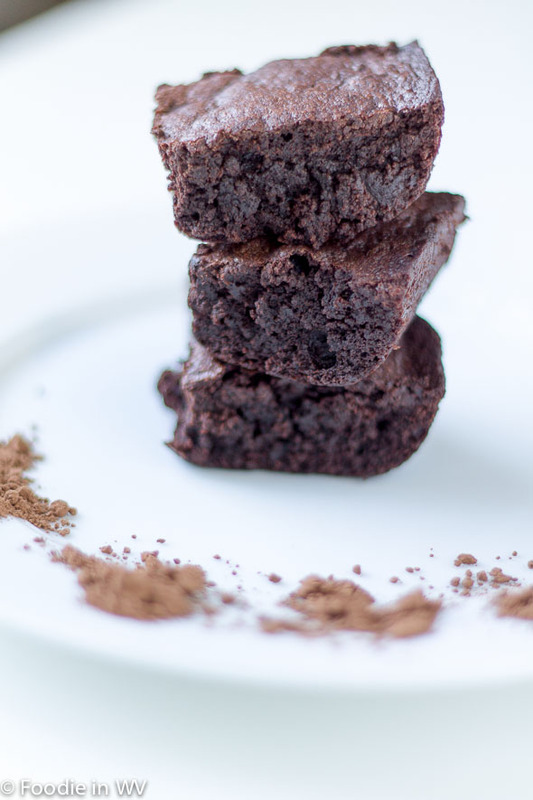 Overall, a great new brownie recipe that I will definitely add to my recipe list. For the recipe go to Cocoa Brownies. they look good!! i like my brownies on the chewy side. Thanks :) They were really easy to put together too! choc and flax?? interesting! i'm loving these brownies, tho! i love mine nice and chewy...corner pieces, of course, lol! I thought it would be interesting, but it was not delicious! I've never seen chocolate with flax seed, but I get why it was on clearance LOL. Those brownies look heavenly! Yeah, there was a reason it was on clearance, yuck! Ahh! I always love your food photos! and the recipes of course! Thanks for the sweet comments, I really do appreciate them! So true, my kids will normally eat anything! These look so yummy! I love my brownies to be more fudge-like than cakey also. Fudge brownies are the best! I'm totally a dark chocolate fan! I also like mine more chewy than cakey. There is something so great about dark chocolate, I agree! Mmm. These sound yummy. I have never tried brown rice flour. I'm going to try these that way! I love using brown rice flour, it's a great gluten free substitute! They were very easy to make! They look really great! I would think a chocolate bar with flax would be good. I guess that's something I will avoid now! My family goes nuts for brownies. These look divine. My family goes nuts for brownies also! And yet another brownie recipe to try. I know I don't have to but every time I look at a picture of a batch of brownies I get the urge to make some. These look delicious. I love chocolate!!! I seem to have that problem too :) Chocolate almost seems to talk to me :) Have a great day also!